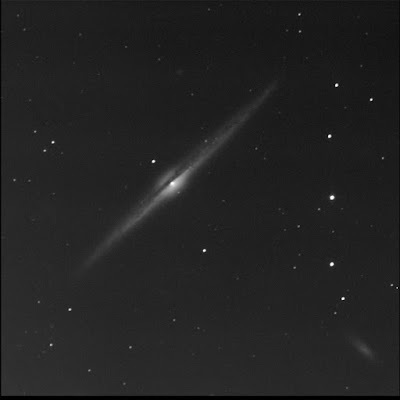 BGO imaged NGC 4565 aka the Needle Galaxy. Located in Corona Borealis. One of the RASC Finest NGCs. First viewed 8 Jul '10. Wonderful. I see a soft fuzzy north of the core of the edge-on galaxy but SkyTools does not mark it. NGC 4562 is south-west of the big galaxy, another canted spiral. Woo hoo.